The Yamaha YZF-R15 S is a sports bike that redesigned with a single seat. 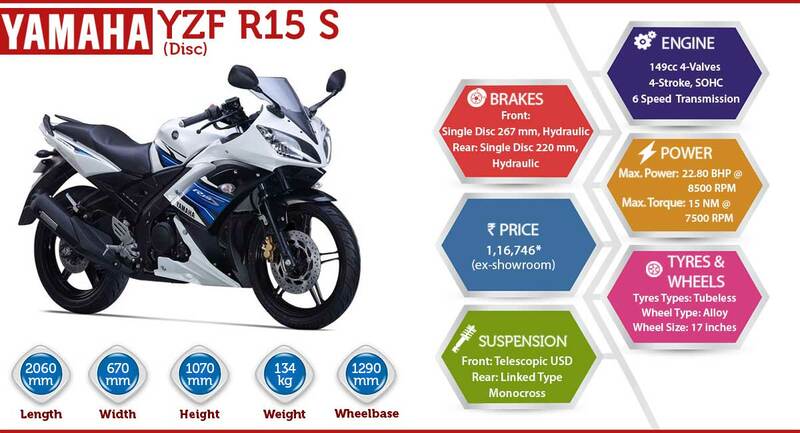 R15 Version 2.0 is the second version of the existing YZF R15 that comes with new graphics. The motorcycle has made few changes as single seat unit and new graphics. The 150cc bike is blessed with broad tires, front fairing, twin headlamp and advanced brakes. The powering of the quarter-liter bike comes from its substantial motor which delivers a dynamic performance. The YZF R15 S is featured with a single unit seat instead of split seats, which provides comfortable sitting position to the both rider and pillion. The handling quality remains the same as it has compact handlebar that provides sportier riding position to the riders. The lightweight chassis endows an excellent stability on the high speed. If the maintenance is considered, the commuter motorcycles of the firm are the best because the products are not equipped with the standard components such as you can easily maintain the motorcycle on your level. The Yamaha YZF R15 S is featured with a compact engine that only required least care. Apart from this, the spare parts of this brand are little bit higher than other motorcycles. The Yamaha YZF R15 S is the upgraded version of R15 which is featured with new livery and single unit seat. The price of the new version remains the same as the R15 Version 2.0.